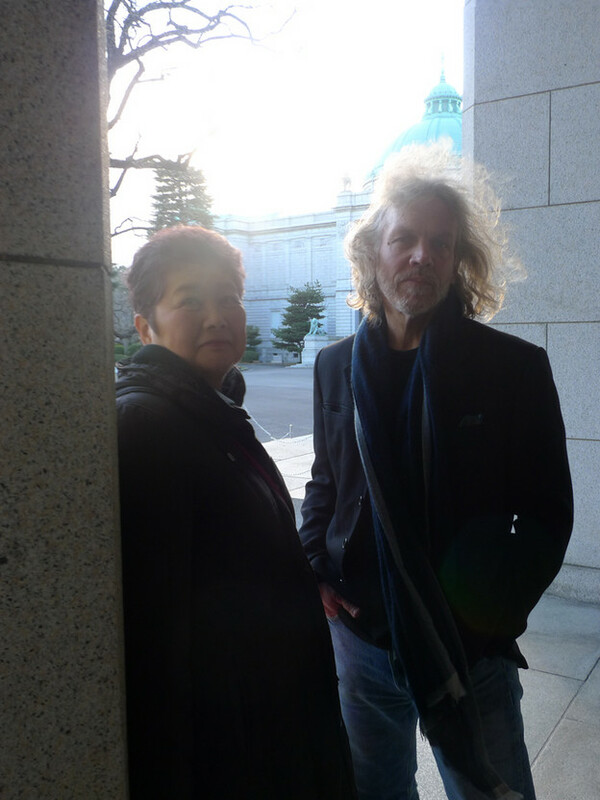 I met with long-time colleagues and collaborators Clark Lunberry and Hiroko Washizu in Tokyo to discuss Sawako Nakayasu’s book of translations and anti-translations Mouth: Eats Color. It seemed appropriate to crowdsource this interpretation, not only because I do not know Japanese—although that has never stopped me—but also because the text itself, while presumably a translation of Japanese modernist poet Chika Sagawa, brings in multiple mouths melding what is less a strict translation and more a reflection on the cultural collisions of transcultural modernism. There are six other contemporary and historical authors in the mix of criss-crossing translations, and this book is, in fact, a self-published paratext of Nakayasu’s more dutiful, presumably one-to-one translation of Sagawa’s work published by Canarium Books. While it might be too cavalier to anti-translate an underappreciated author who died young without giving her a proper introduction to English readers, Nakayasu’s less official version of Sagawa’s work takes seriously the fact that, as a translator of Joyce and Woolf for Japanese audiences, Sagawa’s sensibility may have been more attuned to the fragmented, multi-authored, cross-cultural, indeterminate network that one finds in Mouth: Eats Color than the tombstone of The Collected Poems of Chika Sagawa. An instance of faithful-faithlessness. The first thing one notices about Mouth: Eats Color is that the nice dualities of en-face translation go out the window. Because English and Japanese alternate without rhyme or reason (for example, an English translation on page 61 is followed by its Japanese counterpart on page 65), and Japanese, English and French routinely intermingle within the same poem, the notion of any “originary” source is disrupted. Serial translations of singular poems create patterns throughout the text—less like Steve McCaffery’s The Basho Variations (which, even if one doesn’t know the original Japanese, make one constantly aware of the extent and nature of the variations . . . it is an eminently reader-friendly, English-centric text) and more like the difficulties of actual international travel and cultural miscommunication. Deceptively, then, the most prominent poem is named for a more leisurely mode of motility: “Promenade.” Clark points out that this repeating title is a crucial link to the modernist project, connecting as it does Nakayasu’s iterative translations to the activity of the urban flâneur. We talk about how the word “Promenade” itself is difficult to pronounce in English. It’s a word that puts on a lot of “airs” given its French origins (do we pronounce it like Julie McCoy directing us to the “Promenade Deck,” or like a square dance caller’s “Promenade!” or is it merely “The Prom”?) and this air may get doubly rarified in Japanese, as プロムナアド is a loan word (pronounced “Puromunaado,” the katakana that Nakasayu also enlists as a title). What is the fantastical pavement on which this promenade can occur if cultural commonalities can no longer be taken for granted, if the cracks in its surface reveal the vast Pacific, in other words sous les pavés la plage? The word “pavement” itself, we discover, is a source of trickery in this text. Hiroko notices that there is a mistake in Nakayasu's first iteration of “Promenade,” her first translation of Mouth: Eats Color which includes both Japanese and English text: in the second line of the Japanese, the word for “news reporting” (報道) supplants a kanji that is supposed to mean “pavement” (舗道 or, in other words, a “promenade”). Stateside, I am able to confirm that Sagawa’s original starts that line with a completely different character than what Nakayasu has written. Sagawa’s word for pavement 舗道 can also mean “shop way” or even “arcade,” whereas Nakayasu introjects a new combination that implies "information." I point out to Hiroko that Nakayasu plays with the interpenetration of these seemingly disparate ideas throughout the variations, with “news reporting” and “news coverage” forming a data counterpart to sidewalk transport, deracinating the modernist space of the city. "Reporting" also gives a postmodern twist on the “announcements” of the seasons. For example, one “Promenade” starts, “Construe the report buried by flower petals as one of pressing news—” instead of the more closely translated “Seasons change their gloves.” Notably, throughout the book, Nakayasu avoids anything resembling a more “correct” translation of this intentionally glitched second line: “petals filling up the promenade” (Kikuchi and Hayes’ translation) or "flower petals burying the pavement" (her Canarium Books translation). Is she avoiding the kitsch of cherry blossoms blooming, and finally falling, covering all pavements with news that they are gone ? While visiting Tokyo in the spring, I am astonished by how much news coverage is lavished on the minutiae of this yearly process. Of course, part of our electronic promenades include the bailiwicks of the computer, and I was tuned into some of the more post-natural dimensions of the text when one of my Japanese students told me that some of Nakayasu’s translations are what happens when you write English in Microsoft Word, but have on the romanji converter. Hiroko found what she called a “fake Chinese” poem. For those of us who are not privy to these linguistic pranks, is Nakayasu intentionally playing with our tendency to exoticize, and hence aestheticize, Japanese texts even if they display mere computer noise? What would be the difference between these “fake” translations, and, say, Kenneth Rexroth’s manifacture of a female Japanese writer as a front for his own “original” poems? While Emily Apter, in defending Rexroth’s hoax, says that it is part of the long tradition by which modernist poets “wrenched japonisme from the clutches of bad translation,” one could say that Sawako Nakayasu’s “bad translations” both resist and exploit new forms of Japonisme—at least in its Internet-enhanced, post-j-pop guise . As Clark points out, these poems combine the qualities of refinement and alienation, undoubtedly the legacy of international modernism’s feedback loop. 1. In their recent "Manifesto for Ultratranslation," the collaborative group Antena asserts that "Translation is an asymptote: no matter how close we try to get, there's always a space between the two bodies and that is the space where we live. The space where we transpose, or are transposed." Nakayasu's experiment explodes both this romanticism of "two bodies" (which is redolent of the types of monogamous translation metaphors analyzed by Barbara Johnson and Lori Chamberlain, among others) as well as the "hyperbolic" metaphor of the asymptote—too pretty and too exact to encompass the messy crossings of translation (perhaps the better mathematical metaphor is "rogue factorial," the name of Nakayasu's imprimatur.) The text is the eccentric-center of a much more complicated network, which includes multiple bodies and machines . . . what Lili Hsieh, speaking about the experimental translations of Hsia Yü, calls the "transformed and transforming public sphere of cybernetic conviviality." 2. According to Hiroko, Sagawa ends the first line of “Promenade” with an archaic word for change. I am hard-pressed to find it, although paradoxically, when I input the last word of the first line I get めかへ "to the mechanical." The seasons, then, are changing both with mechanical exactness and with the quaintness of an outmoded modernity; Sagawa seems to play with these types of reversed or complicated temporalities throughout her work. This paradoxical newness, an archaized change, expresses the aporia of modernism at this collection’s onset. The very nice last line of Nakayasu's Canarium books translation of "Promenade" (a version of which is completely avoided in Mouth: Eats Color), seems to challenge easy futurity on a more personal, everyday level: "Evening sets on some promiseless day." Exactly when and how does a day become "promiseless?" Does the evening sanctify that promiselessness, or turn it to something else? Is this lack of promise precisely what characterizes the aimless promenade of the modern, the anti-futurity embedded in its futurist promise? 3. One should not underestimate the influence of Shibuya-keij-pop in the late 90s as contributing to transcultural postmodernism, corresponding to a relaxed translational ethics that had as its analogue the re-embrace of lounge culture and exotica-style musical appropriation, which for decades had been a source of cultural embarrassment in the United States. Recently, contemporary poets have explored translation less as a dutiful way to carry meaning from one language to another, and more as an experimental mode in which to investigate the noise inherent to any act of transmission. Benefiting from a long history of such experiments, such work now is potentiated by access to online digital translation engines, and a growing consciousness of the history of these techniques. How are these types of literary experiments flourishing now in tandem with a remix culture that privileges mutation over originality, sharing over intellectual property, and modes of sampling over dutiful emulation? This column will assess experiments—both historical and contemporary—that exceed the boundaries of translational propriety, and as such, perhaps promise new hybrid modes of creation, communication, and being. Joe Milutis is a writer, media artist, and Associate Professor of Interdisciplinary Arts and Sciences at the University of Washington Bothell. He is the author of Failure, A Writer's Life (Zer0 Books, 2013) and Ether: The Nothing That Connects Everything (Minnesota, 2006). He has produced a number of chapbooks, media works, experimental pdfs, internet writing, and performances that intersect experimental poetics with other interdisciplinary practices. See both his Penn Sound page and his personal web page for other work.